The merging of present and past, the invention of strange objects, the juxtaposition of unlike things, and the depiction of alienation are just a few of the ways in which Magic Realist painters evoke the mysteriousness and uncanniness of everyday reality. The original movement emerged in the 1920s in Germany to counter the emphasis placed on individual subjectivity by earlier avant-garde artists. Initially synonymous with Neue Sachlichkeit, Magic Realism focused less on biting social critique and more on explorations of the strangeness and incongruousness of existence. Often using exquisite detail and unusual perspective, the artists conveyed the wonder of observable reality. Magic Realism's influence spread across media, especially in literature, to become a diffuse practice in several areas around the globe. Never a unified movement, artists in various countries developed the ideas and styles, creating unique versions, which still resonate with contemporary innovators of many media to this day. Magic Realism was part of the trend toward classicism in the interwar years that aimed to move away from more expressive styles. Relying on the undistorted figure, the artists emphasized observable reality. To reinforce their classical tendencies many of used materials like egg tempera, which was popular in the early Italian Renaissance. While Magic Realism is often described as "surreal," the artists themselves were careful to distinguish themselves from the avant-garde group of Surrealist painters and poets. Unlike the Surrealists, the Magic Realists did not wish to probe the unconscious, dreams, or interior states, but rather they emphasized the often-times strangeness of outward experiences. While some Magic Realists use symbols and allegory, many relied on odd juxtapositions of objects, distortions of space, or hyperrealism to convey the mysteriousness of everyday life. By focusing on such devices, instead of fantastical or made-up elements, the artists create spaces that are more universally understood and that do not rely on specialized knowledge. While most Magic Realists avoided stinging satire and social critique of the most strident Neue Sachlichkeit artists, many explored the state of society and culture in a more nuanced way, often making commentaries about the feelings of alienation and isolation felt in the modern era. The origins of Magic Realism are contemporaneous with Neue Sachlichkeit, the Post-Expressionist movement in Weimar Germany that emerged at the end of World War I. The term Neue Sachlichkeit, German for New Objectivity, was officially coined with an exhibition of the same name in 1924. The movement proposed a new focus on reality, portraying an objective understanding of life and art, often using political themes with satirical connotations to bring awareness to ongoing issues of society. After spending a couple of years in Berlin, in 1923 Radziwill settled in the town of Dangast, a coastal city on a bay off of the North Sea. He was both enamored by and reticent about the encroaching technology in this small town. He often depicted this ambivalence in his paintings. Here, in this quiet, rather normal looking, beach scene, an airplane, which seems to lack a propeller and whose body resembles the hull of a ship, flies into the scene, perhaps about to land near the idyllic house. Its purpose, its passengers, its destination all remain mysterious. Additionally, the lighting of the scene and the strange rocks that punctuate the beach seem to have fallen from another world, marking the work exemplary of Franz Radziwill's Magic Realism. German critic Franz Roh initially described Magic Realist paintings as "enigmas of quietude in the midst of general becoming." Unlike his Neue Sachlichkeit colleague and friend Otto Dix, Radziwill opted not for biting cultural satire but for rendering the strangeness of a rapidly changing world that encroached on traditional ways of life. In this eerie scene, four men stand amidst the ruins of Pompeii, the Italian city entirely destroyed in a matter of moments in 79 CE by the eruption of Mount Vesuvius. While the men's tuxedos and suits date them to the Weimar Era in which Willink was painting, the smoking volcano in the background suggests the far past just before the fateful eruption. This disjunction in time creates a mysterious subject, heightened by the fact that none of the men interact with one another, although inexplicably, the man in the brown suit looks out toward the viewer. Willink, like many Magic Realists, was greatly influenced by the metaphysical paintings of Giorgio de Chirico, who used architectural and urban settings accompanied by symbols and strange figures to create uncanny and surreal scenes. The Dutch Willink was one of the movement's most prominent figures and preferred the term "imaginary realism" to describe his paintings in order to acknowledge the role of imagination in creating his compositions. Echoing the Neue Sachlichkeit's "criticism" of society, Willink reveals contemporary society's inner desolation. Late Visitors to Pompeii offers an allegorical warning of the present, suggesting the danger of neglecting past lessons and the obliviousness of the population to world calamities. The painting depicts a "detached" modernity without the deeper metaphysical "considerations" of everyday life that he felt plagued the interwar years. When Ivan Albright painted Ida Rogers, she was not even 20 years old. Instead of depicting the young wife and mother, Albright depicted the woman aged, misshapen, and with gangrenous flesh. Ida vainly observes her reflexion in a hand mirror, holding a powder puff to her chest with her other hand. The composition has all of the hallmarks of a vanitas image. Popularized in 18th-century Dutch painting, vanitas paintings allegorize the fleeting nature of life, the decay of age, and ultimately death. While serving in World War I in the medical corps, Albright, having come from an artistic family, created intricate medical illustrations, which eventually influenced his own meticulous painting style; however, this highly realistic technique simultaneously gives the painting a sort of estranged and surreal mood. Additionally, the precarious angle of the rug, chair, and small bureau further disorient the viewer. During the 1930s, many critics considered Albright one of the main American painters of Magic Realism, referring to him as "the painter of horrors," and later artist Jean Dubuffet wrote that his paintings, "upset with one blow the ramparts of our tastes, our affectivity, our aversions." Despite the horrors and the assault on bourgeois taste, Albright gives his allegorical contemplation of death a poetical air with the title Into the World There Came a Soul Called Ida. The awkward phrase emphasizes the profoundly complex and, often times, difficult process of aging and our relation to it. Having spent well over a year with the young model painting her "portrait," Albright confessed in a poem that he gave Ida, "I dare not look at her for fear I portray / The emotion within me - will lead me astray." In New York Movie, Hopper presents the interior of the upscale Palace Theater that was located on West 46th Street. Movie-goers fill the first rows of the theater and attentively watch the screen, while an usher, in her fashionable blue pant suit stands in the wings. She seems lost in contemplation, perhaps even a bit wistful about something, separated from the other figures. The painting is exemplary of Hopper's artistic language that often depicts urban settings where the human presence is isolated, exposing cities as spaces of disconnection, silence, and solitude. He developed this unique perspective, influenced by his teachers William Merrit Chase and Robert Henri, who taught him to focus on everyday conditions but with a sensitivity for a sense of "estrangement." The American artists associated with Magic Realism distinguished themselves from their European and the South American counterparts by eschewing the estranged symbols and surreal dialogues in favor of mysterious and intangible qualities found in the mundane. In a realistic yet emotional language, they symbolize a sense of displacement within American life. Hopper's Magic Realism acts as a window to an inner world, not only criticizing American life, but also trying to bring an awareness to the inner dialogues of the self within the modern world. Hopper said, "Great art is the outward expression of an inner life in the artist." With these words he flips the subject matter of the work back to himself, claiming that it is his inner life that he is portraying. The Mexican artist Frida Kahlo skirted the boundary between Surrealism and Magic. Realism. While she associated with French Surrealists, including André Breton, she shunned the intellectualism of the French movement, declaring, "I never paint dreams or nightmares. I paint my own reality." That reality included the complex realm of her inner world combined with myth, metaphor, and allegories that she depicted in strange, discordant settings with a static, or timeless, feeling. 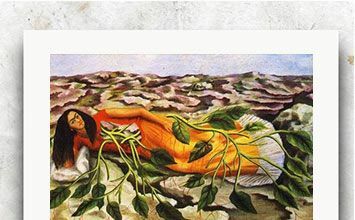 In Tree of Hope, we see Kahlo, familiar from her numerous self-portraits, in traditional Mexican dress, holding a pink corset and a flag that reads (in English): Tree of hope, Stay Firm." Behind her, a woman on a hospital bed, partially covered in a white sheet, exposes her scarred back. This woman is also Kahlo, after a major spinal surgery. When she was 18 years old, Kahlo was in a horrific bus accident that left her spine and several other bones broken. She eventually recovered, but had health problems for the rest of her life and couldn't bear children. Many of her paintings serve as meditations on this experience and pain, and yet she clothes them in traditional Mexican settings and symbols, suggesting a larger meaning for the paintings beyond Kahlo's personal biography. In this painting, the two Fridas occupy a barren Mexican landscape. Mountains can be seen in the background, and the ground contains wide fissures, reminiscent of the scars on her back. Kahlo suggests the destructive nature of Mexico's colonial past, present poverty, suppression of indigenous peoples, and political tumult has left deep trauma on the country and on her personally as well. Writing for the contemporary art magazine, ArtNews, in 1950, art critic and painter Elaine de Kooning wrote in praise of Andrew Wyeth's Magic Realism, stating that without using "tricks of technique, sentiment, or obvious symbolism, Wyeth, through his use of perspective, can make a prosperous farmhouse kitchen, or a rolling pasture as bleak and haunting as train whistle in the night." Soaring is emblematic of de Kooning's assessment. Here, the viewer occupies the realm of birds, gliding aloft a field and looking down upon a small farm house. This aerial perspective is at once dizzying and ominous, as these are not just any birds but three large vultures flying circles around an isolated home. The scavenging nature of these birds coupled with the brown shades of the rolling fields suggest impending death and give the scene a haunting feel. Wyeth's cool, objective approach to rendering the external world was part and parcel of much Magic Realist painting. His exacting methods, which compelled him to spend eight years on this painting, render a scene that is at once completely realistic and yet full of foreboding. Museum director Thomas Denenberg analyzes the foreboding feeling in the context of the Cold War, connecting the scavenging birds flying in the air to the destructive forces unleashed by airplanes during World War II and suggesting that Wyeth had in mind the horrors of atomic weaponry that had been unleashed on the world during the time he worked on this painting. In this rather bleak painting, Tooker presents the viewer with a scene from inside an unnamed government agency. The setting is stark, filled with cubicles that seem to go on forever, and the light is harsh. The anonymous customers all stand with their backs toward the viewer and don't interact with each other. The government agents sit behind frosted glass windows with holes cut in them in order to communicate, although none of them are pictured doing so. Through the cut-outs we see only their sad, empty eyes; while we do see their hands, they seem disembodied, almost surreal. One of Tooker's main themes throughout his work was the alienation and dehumanization of modern life. He heightens the viewer's own alienation by using an odd perspective. We seem to be looking up at the scene, from below, thus not occupying the same space as the figures in the painting. Tooker painted in egg tempera and in such exacting detail, hiding his brushstrokes from view, that the pristine surface further adds to the remote feelings generated by the figures. The stillness of the surface exacerbates the stillness of the figures. They wait. We wait, and it seems that it could go on forever. When asked if he was a Surrealist or Magic Realist, Tooker explained, "I am after reality - painting impressed on the mind so hard that it recurs as a dream, but I am not after dreams as such, or fantasy." In a rather dignified party, mostly men, and a few women, chat with each other in an opulent room, with frescoed, pink colored walls and an elaborate crystal chandelier. On the table to the right, one finds fine glass wear and a silver platter filled with a bright red lobster. On closer inspection, one begins to notice various species of birds perched in the chandelier and on the guests' heads and hands, thus subverting the apparent decorum of the scene. Perhaps Sharrer wants to link the powerbrokers' chatter to that of birds, but as art historian Robert Cozzlinio points out, the birds will surely befoul the party soon enough. Sharrer's use of detailed realism, the unexpected presence of the birds, and the low horizon line of the composition combine to create a work of Magic Realism that leaves the viewer a bit puzzled. Honoré Sharrer came to notoriety in the early 1940s with her depictions of American laborers. Sharrer, like many artists of the time, was sympathetic to the Communist Party, and she continued to hold radical political beliefs. The Reception marks her turn from depicting workers to skewering those in power. At this gathering we see the likes of Senator Joseph McCarthy, FBI Director J. Edgar Hoover, and Cardinal Francis Spellman, who stands out in his red robe, and the elegantly dressed woman in white is Claire Booth Luce. All of these figures played prominent roles in the virulent anti-communist crusade in the 1950s. Sharrer's husband lost his teaching position at Vassar because of his politics, and she herself felt increasingly alienated. It's possible that the woman in the pink gown, separated from the other guests, might be a representation of the artist. The juxtaposition of the real and the improbable allowed Sharrer room for dissent when such voices were increasingly marginalized. In this unlikely scene, a saint floats above the sidewalk, casting a shadow on the nearby wall; a man in a brightly patterned shirt stares out from behind a blue tarp, and a woman escorts a small child up a staircase. Traditionally, the photograph captures a moment in reality, but here Mexican photographer Pedro Meyer collages together three different photographs taken in Oaxaca. Meyer manipulates the images so that they seamlessly blend into one another. The dominant blues — of the wall, the tarp, and the woman’s jacket — tie the images together. Like many of the Magic Realist artists who came before him, Meyer aims to interpret and represent reality, and like his contemporary postmodern colleagues, Meyer draws our attention to the underlying systems that frame our reality. Through the use computer technology he endows the everyday world with mysterious qualities and attributes. The floating saint seems larger than life, and the woman and boy seem surprisingly small. While the wall grounds the viewer in a real space, it, too, seems ominous. In this picture, the floating saint appears miraculously amidst a city sidewalk, mixing reality with religion. Critic Rose Miyonga explains, “His work is Magical Realism; is not purely fantastical because it is not ex-cultural, it is embedded in the real and infused with the marvelous.” Here, blurring the lines between documentary photographs, mystery, and imagination, Meyer is at the forefront of a new development in the realms of Magic Realism, asking the viewer to consider what constitutes reality in this postmodern era.